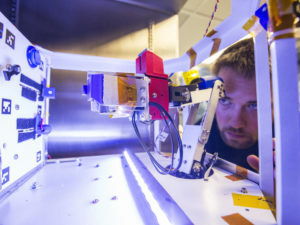 Spencer Lee, of Durham Technical Community College’s Unacceptable Risks, peers at the RAM3 autonomous robotic arm following thermal vacuum chamber testing at NASA’s Langley Research Center in Hampton, Virginia. For the second consecutive year, Durham Tech students are doing great things through a partnership with NASA’s High Altitude Student Platform project. Julie Hoover is a geology and GIS instructor at Durham Tech, alongside her role as the faculty sponsor of the NASA Swarmathon and Unacceptable Risks High Altitude Student Payload teams. Dan Koris and Jimmy Acevdeo are two of Julie’s former students at Durham Tech — Dan studies at the University of Colorado at Boulder and Jimmy has graduated from NCCU and is working at NASA Goddard. You can hear all three below, discussing Durham Tech’s partnership with NASA! 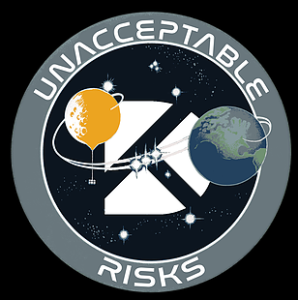 The HASP project launches 12 student payloads via a platform using an 11.8 million cubic foot high altitude balloon that ascends to an altitude of more than 22 miles above Earth. A group of 10 current and former Durham Tech students — the Unacceptable Risks — submitted a 60-page application to be one of the 12 schools participating in the launch. NASA accepted the application with no revisions, and invited Durham Tech to participate in the launch at NASA’s Columbia Scientific Ballooning Facility in Fort Sumner, New Mexico. This is the second consecutive year that Durham Tech has been invited to participate. Last year, students launched the GOAT payload: a device that measured Greenhouse, Ozone and Atmospheric Trace Gas in the upper atmosphere. This year, it’s the Robotic Arm Manipulation and Material Matching (RAM3) payload that’s making the ascension. RAM3’s robotic arm will have a camera that uses computer vision to complete simple tasks like pressing buttons and flipping switches. Students are currently creating 3D printed prototypes, building the frame, and researching robotic kinematics, computer vision and edge detection. Our Swarmathon team win it all last academic year. National championship.